Beginning January 28th, T-Mobile is making some changes to their $50 Monthly4G prepaid rate plan with a boost in data allotment. The 400MB increase will apply to the next renewal and allow for a total of 500MB total data before throttling. 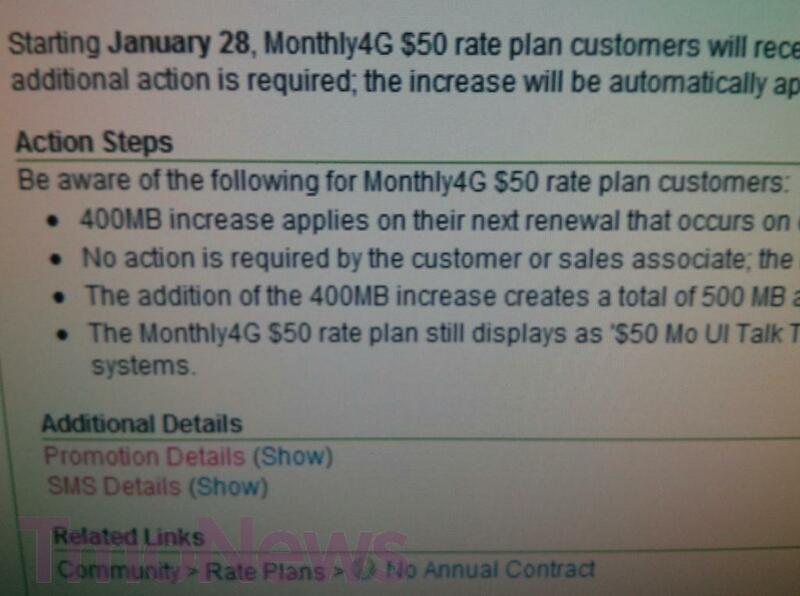 The increase in data will automatically apply to customers now on the $50 Monthly4G plan. This additional data increase comes almost two weeks after T-Mobile boosted their $70 Monthly4G plan to unlimited data. As T-Mobile continues to be a leader in the prepaid market, the additional data allows for customers to feel a little more secure in their data use. This sounds like a nice step in the company’s continued focus on prepaid offerings. ← Question Of The Day: How’s Your Coverage In T-Mobile’s Modernized Network Markets? That’s nice of them, now if they up the $60 plan to 5GB…lol. People will jump over to Prepaid quickly…I know I would, lol. Go TMo, keep up the good work. If they do then people might jump down from the true unlimited plan down to the $60 plan once they figure out they will never use more then 4 gig’s of data a month. That doesn’t bode well for T-Mobiles pocket. I use over 20gb a month lol, I’m on the unlimited classic plan right now. Thanks for messing it up for everyone else. From a sales associate perspective: If a customer brings their own device what incentive is there for them to sign up for a value plan contract rather than a prepaid plan. None..esp now with unlimited on prepaid. For single lines, not much. Value plans are great for more than 3 lines. I bought a GS2 for $300 from WalMart and added it onto a family value plan for $10/month. It’ll go up to $15/month next January. I can’t get any prepaid line that cheap. I get 1000 mins, unlimited texts, and 2GB of data. domestic roaming, international roaming, EIP available in case they chose to get a device later on, a real customer support line, mcsa/gsa, take part in sales (valentines day, fathers day etc), tower priority, wifi calling, loyalty discounts and offers, family plan = 1 bill. if they are bringing an iPhone over, pitch value as our “iPhone plan” and just throw in gibberish about locking in a good rate for 2 yrs etc. International roaming – extremely expensive, especially for data. Wifi calling – available also to prepaid. Wow, you really *are* the “worst_rep_ever”! … and a racist, too! Postpaid and M4G (prepaid) accounts have the basically same features & coverage. The main difference is yes, like the person below said. Family plans. Another thing most people don’t know. Caller ID. There isn’t any Caller ID feature on prepaid. Most people who bring their own device do it for a reason. No contract. a lot, for starters if they brake, lose , or just want to get a new device they can do EIP right away, the customer service for post paid is much better than the prepaid . This is better than simple mobile and straight talk right? If so, solid move to compete. Isn’t the straight talk $45 for all you can eat? All you can eat until they arbitrarily decide you’ve used too much and cut you off. I agree, unlimited is the way to go. Just pointing out that Straight Talk’s unlimited doesn’t come without drawbacks. If you want truly unlimited prepaid, the Monthly4G $70 unlimited everything is the only way to go IMHO. Yup, you are right. This makes it a little more of an even playing field then. Save $5 or get a little more data. Straight Talk is great, except if you need customer service which is useless. Straight Talk is great, unless you want to port a number over which they screw up always and lose numbers. Straight talk is great unlimited – err 2gb, err if they determine you used too much that day and they throttle you until the next bill period. Straight talk is great, unless they lose your number and give it to someone else the next day even though you have auto renewal and they took your money and closed you account and gave your number away. All you can eat indeed. Straight talk is great, as long as you never have any problems. I know this seems like a small move, but T-Mobile is seriously making numerous moves for the better and are really shaking up the industry if you ask me. Finally being BOLD and not only saying it like in the past. I like this new CEO, Magenta’s plan for 2013 is just incredible and has really for the first time gotten me excited. I saw this coming. But I think this is a good move for T-Mo. Anyone else complains about it should just cough up that extra $10 for 2GB of 4G. Meanwhile I’m satisfied with my $30 5GB of 4G plan. Haha! Yes!! I have been waiting for this day. 100mb was way too low, I’m glad they’re raising it to 500mb. Hopefully they will bump the 60$ to 5gb and the daily 3$ a day to 300mb instead of the 200mb they are offering now. Any changes to their mobile broadband plans? My grandfathered webconnect looks like 100% unlimited now. I used around 6GB and I have not received warning text nor got throttled yet. I’m not grandfathered. I wonder if I sign up I’ll get unlimited or you’re just experiencing a system error. I always go under 5GB with $40 webconnect (I signed it up once the “no overage” is available), but I had very high usage this billing cycle due to vacation. My data option on voice line is 100% unlimited and I used 16GB so far. I will observe for couple more months to verify. Awesome, but I’d like to see 500 mb for the lowest tier of data for the value and classic plans too. The $60 Value Plan with a 2-year contract gives you unlimited talk, text and 2GB of data. Why would TM offer a better plan to non-contract customers? TM already offer a significant saving over AT&T and Verizon, but that hasn’t stopped the loss of post-paid customers. Reducing their income substantially by further widening the price gap isn’t likely to be the best thing they can do when they need funds to address the main issue that is held against them – their network coverage and reliability. They have a $4 billion network modernization program under way, with the first $1.4 billion addressing the migration of 3G/HSPA+ services to the PCS band and the deployment of LTE to the top 100 or so markets. It’s unlikely there will be any significant reduction in pricing while that spending is going on. I never saw anything more than speculation that the One X+ was coming to TM. The simple fact is that TM don’t make enough money from their service plans to continue with competitive subsidies on top-end devices. That’s why the Classic Plan will be gone very soon, but they will continue to offer installment plans to recover the full price of devices, offset by the lower Value Plan pricing. When that is in place, there won’t be any reason to avoid any top-end device. Because non-contract customers pay full price for their phones. so do value plan customers. I am not sure if prepaid get wi-fi talk options and international roaming? Anyone care to comment? I get Wi-fi calling on my GS2 but I don’t use it because its not unlimited and uses my minutes. I think postpaid only gets Unlimited Wi-Fi calling feature. But there are reports of ppl on Monthly 4G even with the $30 plan where some was able to get a few stupid reps to turn that feature on for them. Why to you need unlimited Wi-Fi minutes if you have a plan that includes unlimited minutes anyway? Makes no sense at all. Only Postpaid gets Free Wi-Fi calling. Postpaid also gets roaming privileges domestically. Not sure about international roaming. I cited the value plan because the customer pays full price for the phone, same as pre-pay. I believe that they should do a $10/mo. plan of 500 minutes talk and text, a $20/mo. 1,000 minutes talk or text a $30/mo. plan of 2,000 talk or text and 500MB data, a $40/mo. plan of unlimited talk, text, and 1GB of data, $50/mo. plan of unlimited talk, text, and 5GB of data, and then do the $60/mo. plan of unlimited talk, text, and 10GB of data. Also, pre-paid data of 5GB for $30 like the current one then have a $50/mo. plan with 15GB of data unlimited text sms and mms and any instant messaging like facebook or skype! did anyone notice that they took away the $15 hotspot add on option from the monthly 4g page? Yeah I noticed. They should have kept a 5GB option for those who wanted the hotspot add-on. I understand the reasoning for no hotspot with truly unlimited 4G. in addition to making changes on data allotment on prepaid, T-mobile should adopt multiple tiers on Value Plan minutes, the two options of 1000 min and UL are too restrictive from a family account perspective. Perhaps an incremental 1000 minutes per line added. This lines Tmos offering up with MetroPCSs latest changes too. I have heard that T-Mobile is doing another big revamp of their rate plans and data offerings when they convert to Value plans only. Does anyone yet know of the details of the new offerings? In other news, Apple sues LG for having touchscreen that, get this… You Touch! So if my plan renews this 1/26, I wont have my extra 400mb until I renew again in 2/26? It’s now Jan 28, the date this change was supposed to go live but http://prepaid-phones.t-mobile.com/monthly-4g-plans is still showing only 100 MB of 4G data on the $50 Plan. Change of plans or web site not getting timely updates?